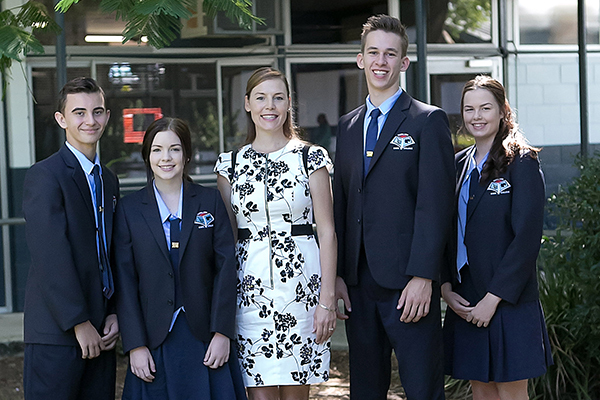 Regular columnist, Bronwyn Johnstone, Principal of Queensland’s Capalaba State college, speaks to Education Matters about her approach to inspiring students. How does the college’s philosophy and ethos guide it today? Our college motto “live, love, learn, leave a legacy” is reflected in the evolution of the college and holds true today. The original Capalaba State School has a history of more than 100 years and over that time has seen many students live out the motto. This ethos guides our interactions and unites our spirit. We encourage our students to live, to get involved and not let life pass by, to stand up and be counted and contribute. Our students are an extraordinary group of people who are talented and excel at sports, music and academic pursuits. Love is important in our world. We encourage our students to share their love through being kind and generous with their talents, time and words. Being kind is a way of living that keeps giving long after the kind thoughts, words, and actions have taken place. Kindness is a force without force, it goes well beyond manners, to the heart of how people respect and treat one another. Being kind is a vital way of making our own lives, and the lives of others, meaningful. Kindness is not a weakness, but the strength of a leader. Learning is the heart of our agenda. The ability to learn is the one trait that will prepare a student for whatever the future holds. Life, technology and occupations are constantly changing and to be able to stay relevant you must be able to learn. Students at our college are challenged daily to think, problem solve and analyse. Part of the motto, leave a legacy, is a challenge to inspire, create or participate in such a way that your influence is felt in a positive way long after your time here at the college. We challenge every student to achieve their personal best and espouse the college values of being respectful, responsible, positive, safe and a learner. Staff and students are proud of the college’s history and continue to contribute to its evolution while holding onto tradition. One tradition that has grown over time is our connection to the college animal emblem, the possum. The possum now represents our sporting excellence with our sporting teams proudly wearing the possum logo. How does Capalaba State College differ from other schools? Capalaba State College differs from other schools in its structure, offerings and approach to innovation. We are the only state Prep to Year 12 college in the Redlands. As a college, we are able to provide a seamless education and culture a family feel. We are proud of our strong connection with the community and there are substantial feelings of ownership of the college among students and their families. Many families have generational connections with Capalaba State College. We pride ourselves on being leaders of innovation. Over the last four years, the college has introduced a Health academy, scholars program, high performing sport program and digital technology. The Health academy provides opportunities for students in this fastest growing employment industry, with connection to Health partners who provide hands-on experience and articulation of student learning into school-based traineeships. The scholars program recognises and challenges academic students through goal setting, study skills and a targeted curriculum. Students are inspired to aspire to reach higher. Our high performing sport program allows students to receive specialist coaching and training in volleyball, basketball or football. The program is complemented by connection to Volleyball Australia, Brisbane Bullets and Logan Thunder QBL players. All Health and Physical Education teachers are also qualified coaches in their chosen sport. The digital technology space is constantly emerging and is always exciting. Students on the junior campus are developing their skills with patterning and have begun to write in code. This work is extended on the senior campus, where students design and develop computer games and apps. We have also introduced 3D printing which connects across so many subject areas. In what ways has the college evolved over the past 10-20 years? Capalaba State College has a history of evolution. The college was the first school in the Redlands. Initially, just a primary school, Capalaba State School opened on Mt Cotton Road in July of 1880 with 22 pupils and one teacher. The college has grown to serve the needs of the booming residential developments in Redland City. In 2005, Capalaba State School amalgamated with Capalaba State High School to form Capalaba State College. It now offers a complete education from Prep to Year 12, with invaluable opportunities to foster community and ownership. The college has evolved as the surrounding city has evolved. Its relationship with the wider community has created diverse and numerous opportunities. The most significant way the college has changed has been our approach to meeting the needs of senior students. While completing their school subjects, students are studying TAFE courses and completing apprenticeships, alongside students completing work placements and university subjects. This flexibility allows every student to personalise their education. We will continue to evolve in the future with staff and student’s input. It is our commitment to one another that allows collective ownership to shape our future. How do you provide support and leadership to your staff? Leading oneself and others is central to the work of a principal. I am best positioned to serve my team by building capacity through coaching and mentoring. I work closely with the middle management team to set up the structures for professional learning teams. Each team use the cycle of inquiry to understand their data and drive student performance. Team leaders participate in further collaborative inquiry, interrogating practices and looking for opportunities to grow and develop. Teaching is a profession of learning. At Capalaba State College, we ensure our beginner teachers are mentored with the support of their head of school. All staff engage in an annual performance development process, which allows for personalisation of professional development needs alongside the college’s targeted training programs. I believe every member of the college staff is a leader of self and others. Our professional development program includes annual leadership inspiration for all staff members. Additionally, I conduct an aspiring leaders program for staff members motivated to pursue promotional opportunities. Participants review leadership theory and apply their learnings to school-based projects. I foster a commitment to learning and collaboration. What role do you play in the day-to-day activities of the college students? For me, education is the most powerful tool to change lives. Our role in schools is to equip students as confident, capable, ethical members of society. My role as principal is to shine the light on our success to inspire staff and students to do and achieve more. Highlighting success builds momentum and Capalaba State College has produced the strongest tertiary entrance ranking and exit results in the Redlands. I believe the principal’s role is to be the leader of learning. I enjoy an active role across the college, regularly visiting classes and working with students. I conduct academic reviews with senior students and provide feedback on their progress. I meet regularly with the college captains, inviting their feedback and sharing in their ideas to foster school spirit. What are some of the more critical issues faced by educators today? The most significant issue faced by Queensland schools today is the change in senior school processes. The change in entry ranking processes will challenge our pedagogical approach and relationship with assessment. While it is an exciting time for schools, it also a time of significant change and learning. Alongside the move to the ATAR system, the senior curriculum has been rewritten and new subjects have emerged. Now is an important time for schools to work together to assist teachers in adopting the changes. It is also important for schools to invest in professional development for teachers to support the required changes in pedagogy. What has been your most memorable moment, either as a teacher or specifically in the role of Principal? I have enjoyed so many wonderful moments over my career, from swimming on the Great Barrier Reef with extension Science students, to walking on the Great Wall of China as part of a study tour. The moments that resonate with me most however, are the senior formals. On that night, we have a small glimpse of the amazing young men and women of the future. It is a night of celebration of past achievement but equally a night that holds the hope of the future. I am immensely proud of all the young men and women who I have had the opportunity to work with over my career. What traits make for an effective and successful leader in education today? Workplace communities and organisations that are focused on success and learning are not built overnight. They are “products of carefully cultivated attitudes, commitments and management processes that have accrued slowly and steadily over time” (Garvin, 2009). There are observable characteristics of the lived culture such as trust, collaboration and direction. Culture is built on trusting relationships, the relationships people have with each other in the workplace exerts a powerful influence on the behavior of the working group. Research shows that working groups built on trusting relationships are more effective and efficient. Trust builds momentum, as people want to work with you, they feel empowered and motivated to be their best. Equally, collaboration and vision support the success of a school. Collaboration is important as education is not an individual pursuit. We need to work together to improve and grow. By working together we gain perspective, we develop respect and consideration and acknowledge individual strengths while celebrating the team’s achievement. A clear vision empowers teachers to be proud of their work and want to contribute to the success of the school. The leader needs to provide an unambiguous direction. Can you describe any specific ways in which the digital era is beginning to disrupt the education field? Technology is an important part of our lives, however, I don’t see it disrupting education in the same way that Uber has disrupted the taxi system. This speaks to the care and concern we have for our children. Attending school is an important way that we can ensure our children are looked after in their formative years. What technology has done is open access to knowledge and create connections. Capalaba State College students travelled to Athens in July this year to compete in the World Scholars Cup. All preparation for the competition was completed online. It is this type of connection that will create opportunities for our children now and in the future. Technology allows us to be more innovative and to work with students’ creativity across curricular engagement which aligns to the working profession. It is important not to undervalue traditional skills, and always view technology as the complement to learning that takes place in schools.